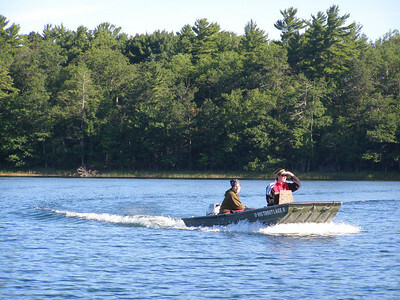 On a recent summer day, researchers from the Center for Limnology, put boats in on Sparkling Lake, a research site of the North Temperate Lakes Long-Term Ecological Research (LTER) program, and site of a nearly decade-long invasive species control effort. 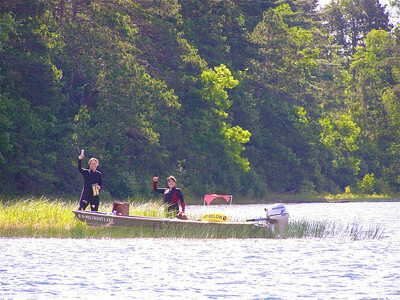 Gretchen Hansen (right) and Ali Mikulyuk (left) pilot a boat full of scuba gear to the far shore of the lake. 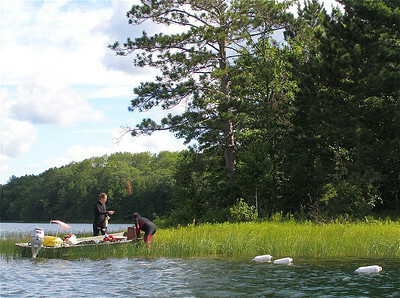 After the "support team" sets out a series of buoys marking transects, Gretchen and Ali prepare to head underwater and take a census of the macrophytes (aquatic plants) growing in Sparkling Lake. 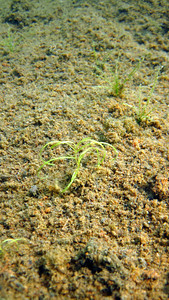 A decade ago, the lake bottom looked like this - a carpet of sediment and algae, scattered with a few stunted aquatic plants. 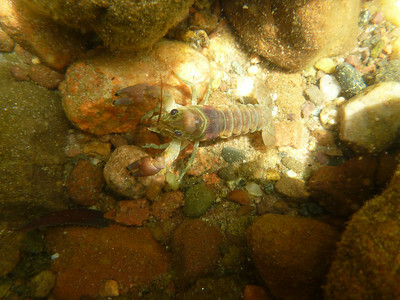 The "deforestation" of Sparkling Lake was a result of an invasion by the rusty crayfish, a non-native species that clips aquatic plants right at the roots to improve its field of vision as it hides from predators amid the cobble. 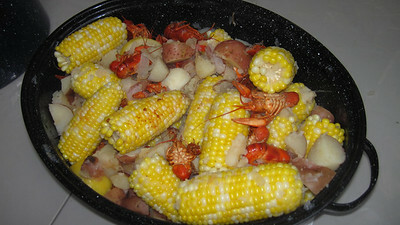 To fight the invasion, teams of students and faculty worked full-time, trapping all day over eight summer field seasons and, often, eating their catch that night. Today, four years after trapping ended, it's still it's rare to catch even one rusty. Gretchen and Ali head under to see what Sparkling Lake looks like four years after intense trapping efforts dramatically reduced the lake's rusty crayfish population. 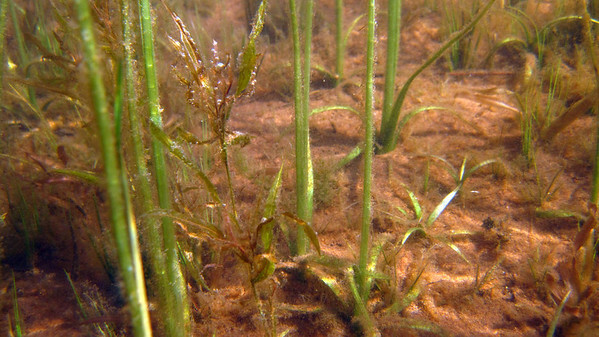 What they find is a lake bottom now flourishing with a diverse array of aquatic plants. 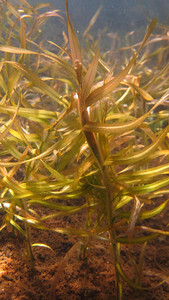 This thick cover of the native plant, ribbon leaf pondweed, grows in a once barren section of lake bed. 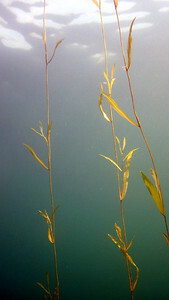 Stalks of variable leaf pondweed, also a native, grow toward the surface and the sun. 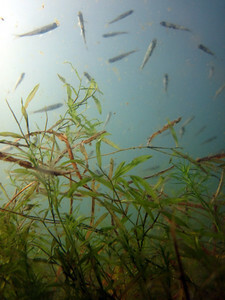 Aquatic plants provide important habitat for animals living in a lake. 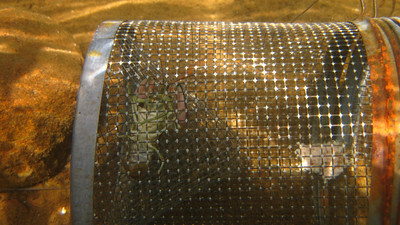 Aquatic insects live on the plants and fish take advantage of thick growth to avoid predators. 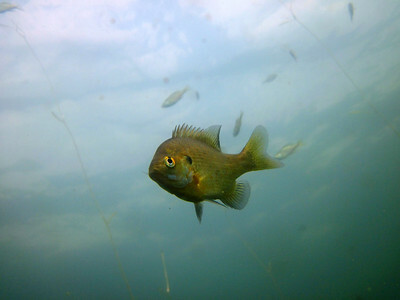 Today, bluegill like this adult and the young fish swimming in the background are thriving once again. 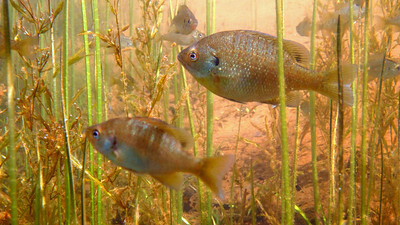 Once thought to be nearly gone from the lake, bluegill now drift among the macrophytes on the lookout for aquatic insects to eat and fish (like smallmouth bass) to avoid. 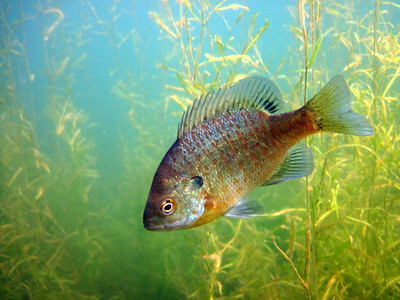 Researchers think sunfish species (like bluegill) are helping keep rusty crayfish populations in check by feeding heavily on the larvae of the invader. 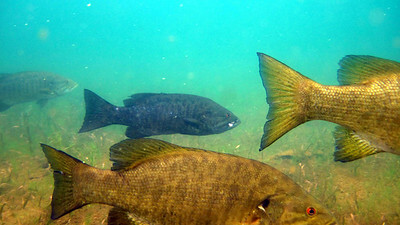 Predators like smallmouth bass also help keep rusty numbers down by eating adults. 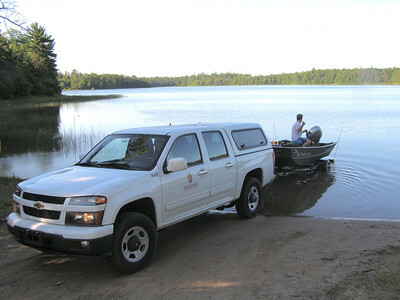 Bass also love to eat bluegill and, when the lake was missing its cover of aquatic plants, bass hit them hard. 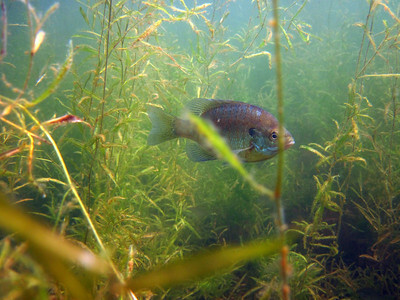 Today, schools of bass still thrive in the lake, but the addition of habitat via the regrowth of aquatic plants has allowed sunfish populations to coexist with their predators. 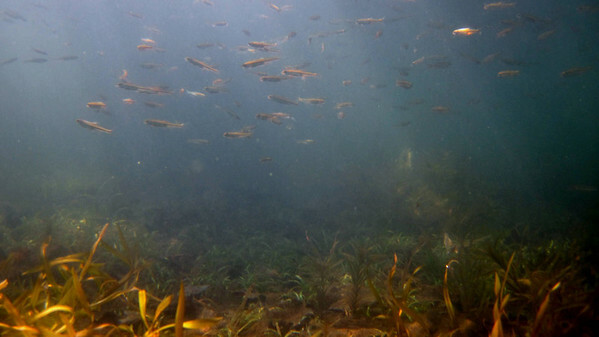 A bluegill hangs out in the underwater "forest." 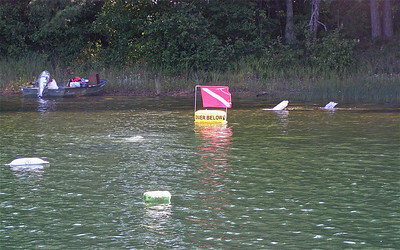 Back from their dive, Gretchen and Ali are happy to report that Sparkling Lake is making a comeback. 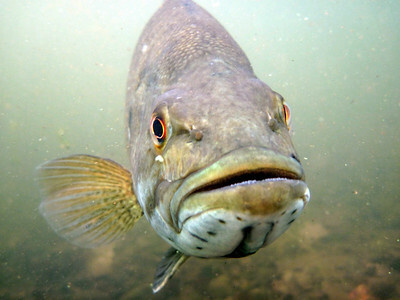 And, today, a lake that was once out of balance and under assault from an invasive species, is a healthier ecosystem for a diverse array of species.